I don’t know if there is any God’s call for me to have a break during Decembers. The last December also I had a break from all my activities. Since I had an eye surgery during mid December. But I was having an urge to decide upon the Word Of The Year 2018. And thought, this will be more encouraging to make again a return back for my blogging. So it goes here. Actually speaking, I tried many methods to work on my aim for any new year as goals, resolutions and pledge. But nothing worked after two or three months. I was really scratching my head how to go with it. Then I found that the philosophy of choosing a Word of the Year inspired by Laurel. I selected the WORD of the year 2016 as EMPATHY. My Word Of The Year 2017 – Mindful. And I was so excited it worked for me amazingly. I was able to post “7 Everyday Practices For Mindful Moms”, a seven day series that had seven practical steps to be mindful for all moms. No need to mention that it was a big hit. With that overwhelming applause, started the “Free 5 Days Ecourse On Being Mindful With MSN!”. This is also getting viral with more than 75 members subscribed in one month. If have not yet signed up, here you can do so. I hope I went by the WORDS by all means. Inspired by Upasna, I love to choose the Word Of The Year 2018 as Minimalism. When I reviewed her ebook, A To Z Of Minimalism, I realized the power of Minimalism and decided to select that word for 2018. Things In My Home – To create more space and get organized. Still I have to explore how Minimalism could help me for the betterment of my life this 2018. Joshua Becker‘s What is Minimalism? Do You Believe That A Word Can Change Your Life? If so, What Is Your Word Of The Year 2018 ??? 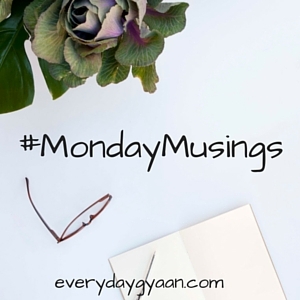 Linking this post with #MondayMusings hosted by Corinne & #QuotedStories hosted by Upasna. Hey Vasantha, I am glad you are back. How did your surgery go? Hope you are fine. Thanks for putting me there on your inspiration list. I think different things work for different people. I am glad you found Minimalism useful. And I am sure you will find so many things on the journey. Good wishes. Happy New year. Recovering slowly, dear. Hoping for the best. Thanks. Glad to have you back, Vasantha. I hope you have recovered well after the surgery. Let’s keep that aside and look forward to new beginnings. Thanks to the mindfulness course that I signed up for, I have become a calmer person. It is certainly helping me. Coming to the word of the year. I read quite a few posts on it and have chosen ‘Focus’. I generally lose focus in something I start quite easily. 2017 has been a year where I did many new things, I explored many new avenues, came out of my comfort zones to attempt quite a lot which I had left mid way during my childhood. So I want to keep the momentum and have chosen ‘Focus’. I am going to focus on my personal well being – emotional, financial and physical. All the best to you for the coming year. Thanks a lot for your loving and encouraging comments. And you have chosen the best word for this year. All the very best to you, dear!!! impressed with such a simplicity yet very thought provoking writeup.